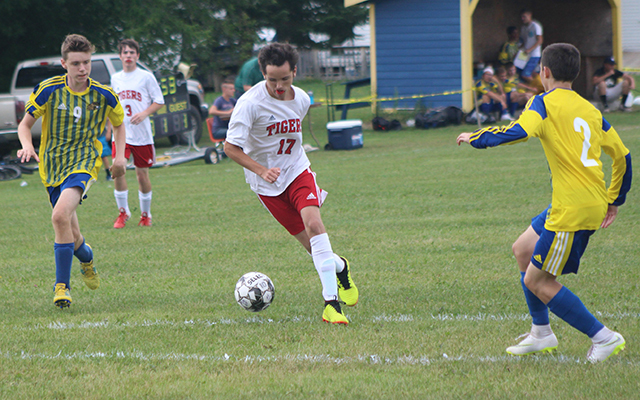 The Fort Kent Warriors were successful in their season-opening soccer matches played Wednesday against Fort Fairfield on their home field. The Warrior girls breezed to a 6-0 victory, grabbing a four-goal lead at halftime before tacking on a pair of insurance goals. Eight different players picked up either a goal or an assist for the winners, with Morgan Cyr tallying twice and Desirae Hafford, Gabby Martin, Kate Lamarre and Jacklyn Pelletier adding one apiece. Cyr also picked up an assist, while Lexi Lovley, Kailee Guimond and Amanda Thibeault each chipped in with an assist. Lyndsay Ouellette earned the shutout in goal by saving all three shots she faced. Meghan Schupbach and Shantelle Simon shared the goalkeeping chores for 1-2 Fort Fairfield, making 10 saves on 36 shots. The boys game was called off at intermission due to weather conditions, but Fort Kent netted five first-half goals to garner the victory. The Warriors held the Tigers without a single shot on goal. Austin Plourde scored his team’s first goal and the final goal, while Noah Martin, Austin Delisle and Camden Jandreau also netted goals for Fort Kent. Colby Theriault set up two of his team’s goals, while Delisle and Alex Sutherland each notched an assist. Kobe West saved six of 13 shots for the 1-2 Tigers. Only two matches are scheduled Thursday, but one is a huge early-season tilt featuring two of the top girls’ teams in Aroostook County. Central Aroostook, with its 2-0 record, makes the trip to Ashland to take on the defending Class D regional champion Hornets, who opened with a 12-1 victory Aug. 20 over Easton. Both teams feature a strong defense and potent scorers, with Kate Levesque having scored six goals in the first two games for CA and Ashland’s Shelby Stolze breaking through for four goals against the Bears. The game will kick off at 7 p.m. and is preceded by the boys’ contest between the 2-0 Panthers and 0-1 Hornets, which begins at 5 p.m.